Payday: The Heist is a cooperative first-person shooter video game developed by Overkill Software and published by Sony Online Entertainment. It contains seven different missions (including the free No Mercy DLC released on 25 July 2012), with each mission containing random elements which alter the gameplay in subtle ways with the aim of enhancing replayability. On 7 August 2012 the Wolf Pack DLC was released on PS3 and PC. This DLC added two new heists, additional weapons, and a new player upgrade tree. 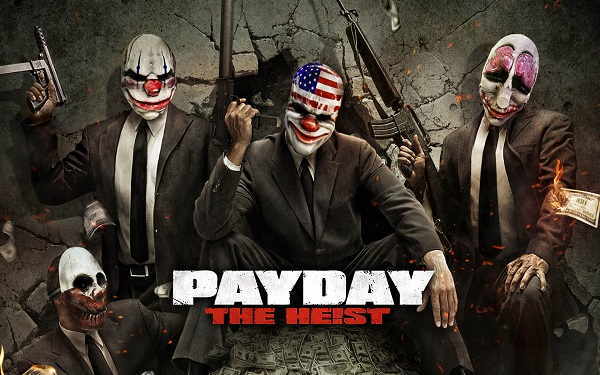 In Payday: The Heist, players use a variety of firearms to complete objectives (usually centered around stealing a certain object or a particular amount of money). The game plays from the first person perspective, but offers a few twists on the standard FPS formula. Killing civilians is frowned upon, meaning players have the option of restraining civilians until the heist concludes. Should any player die during the heist, one of his teammates may release a civilian in exchange for the player to respawn.